"This is the best recipe for a fresh and light coleslaw that goes well with everything. 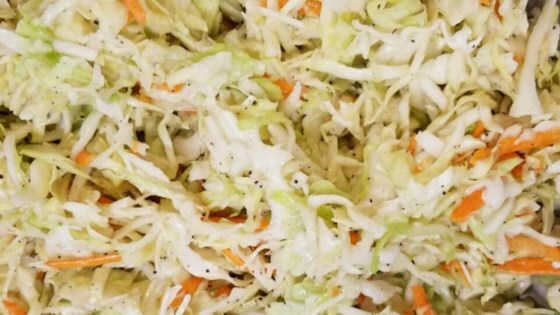 This is the only coleslaw recipe you'll use once you've tried it." Whisk apple cider vinegar, canola oil, sugar, dry mustard, poppy seeds, black pepper, salt, and hot pepper sauce in a bowl, stirring until sugar has dissolved. Mix cabbage with carrots in a large salad bowl and pour dressing over slaw. Stir to coat. Refrigerate at least 2 hours before serving. Learn how to whip up a fresh-herb salad dressing in just two minutes. I made this recipe and it was ok but not sure I will make this recipe again. Not too fussy on it. Very nice and refreshing! Added an extra tbsp. of vinegar and a dash of celery seed. Hooray for non mayo based coleslaw! Simple and by using honey (1 T), I was able to make it more paleo, less GMO. OH, after marinating and refrigeration, was tasty and crisp. A tad sweet with only 1 tablespoon sugar and 2 tablespoons light olive oil. Used lots (for me) salt and pepper but no hot sauce. With cilantro, would be great on fish tacos. Enjoyed this as a light vinaigrette slaw. Slight changes by using honey & dijon mustard were better choices for our family. A great healthy mayo free slaw.